Martin Scorsese may be getting better with age. His last two movies (Shutter Island and The Departed) have been amongst his best ever. I'm starting to think that he's getting better as a filmmaker thanks to his partner in crime, Leonardo DiCaprio. 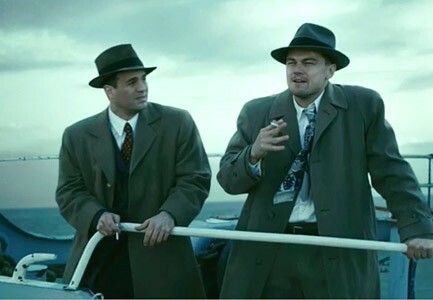 Marty and Leo collaborate once again on a thrilling and gripping mind-bender of a mystery in Shutter Island. As some of you may already have read in other reviews, this movie has some major plot twists which I won't reveal in this review. The setting is rather simple. Two federal US Marshals visit a maximum security psychiatric ward on a remote island off the coast of Massachusetts. Someone has escaped the mental facility and DiCaprio and Mark Ruffalo must track down the escapee and solve the mystery of the island. The film is shot wonderfully in dark and depressing tones (the constant bad weather during the stay on the island adds to the overall gloomy effect). Scorsese does a great job of inter-cutting back story through brief flashbacks to fill us in on the narrative provided by Dennis Lehane's novel. An intense score composed of previously released songs played at the perfect time help add to the atmosphere. Amazingly this is not an original score but the arrangement evokes memories of the brilliant in-your-face over-the-top music found in There Will Be Blood. The acting across the board is outstanding including great supporting performances from Ben Kingsley and Michelle Williams. You really find yourself believing that you are on the island, immersed in the scenery. What takes this movie to that next level is the acting typhoon that is Leo DiCaprio. He completely owns this performance and makes you fascinated with his character from start to finish. Simply put, DiCaprio is the greatest actor of his generation and I hope the Academy remembers this performance a year from now. If Shutter Island was released as originally planned in 2009, he would be in the 5-man race for Best Actor for sure. I hope he decides to try to branch out more and work with other directors, but after the last two Marty/Leo collaborations, I can't really complain too much. After much thought I will go ahead and give this a perfect 5 out of 5 JR's. This is the best film I've seen since District 9 and is immediately the front-runner for the 2010 Oscar for Best Picture. After knowing the plot twist in full I feel like I need to see the movie again to watch it from a different vantage point. I'd almost like to have another blog post where I can talk about the full plot for those who have seen the movie. If you want to do so, send me an email. I hope this will not be my only 5 JR movie of the year, but the bar has certainly been set high. The Clash of the Titans remake with Sam Worthington is next up on my radar. Will you be blogging your Oscar picks??? I am relying on you since I've seen so few...of the ones I've seen, my pick for best picture is the Hurt Locker!